The QV500 cell culture chamber is a highly flexible research tool, ideal for academic use. 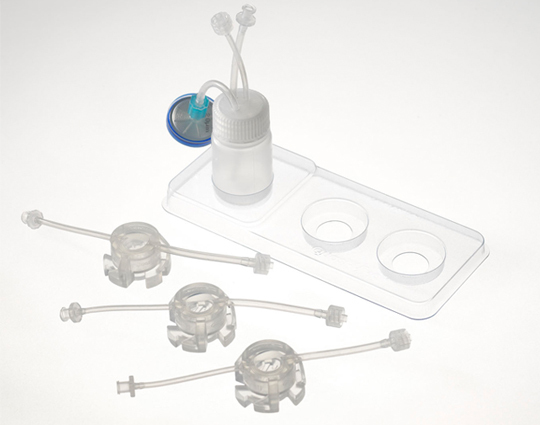 Produced from medical-grade silicone, the chamber provides a leak proof seal, allowing continuous flow of media across and through cell cultures. Is the QV500 system applicable to your project? Contact us to find out! The chamber has a common diameter with the wells in standard 24-well plates, allowing for protocols developed for static cultures to easily be transferred to the system, as well as providing compatibility with both coverslips and a range of 3D scaffolds. The modular design allows the system to be customised to provide the most suitable model for each specific experiment. The QV500 chamber is currently being used by both academic and industrial laboratories worldwide, here’s a selection of the published papers that have used QV500 within their research. Authors: Iori, E. et al., 2012. Journal: PLoS ONE, 7(4), pp.1–9. Design Criteria for Generating Physiologically Relevant In Vitro Models in Bioreactors. In vitro generation of functional liver organoid-like structures using adult human cells. Authors: Ramachandran, S.D. et al., 2015. Journal: PLoS ONE, 10(10), pp.1–14. The QV500 starter kit contains all of the parts you need to set up a Quasi Vivo® system. With the addition of a peristaltic pump, the kit provides everything you need to convert your existing 24-well static cultures to flow. 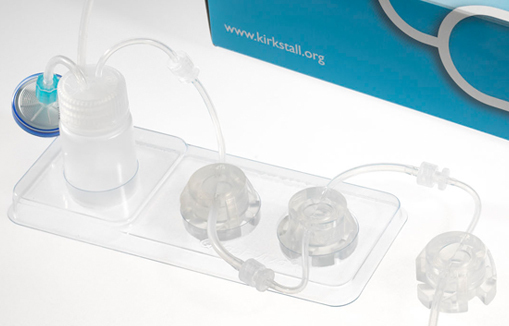 In addition to three chambers and a reservoir bottle, the kit also contains ample tubing and connectors to set up the system, as well as holding trays for the complete system and a comprehensive user guide. Fill out the form below to download the QV500 Starter Kit User Manual. Quasi Vivo®, commercially available and used in 70+ labs worldwide, getting started is easy and cost effective! We will only ever send you emails related to Kirkstall Ltd. and will not share your information with any third parties. By clicking submit below, you agree that we may process your information in accordance with these terms.